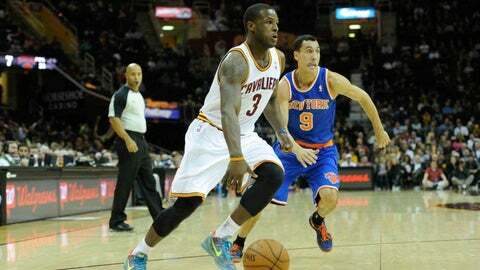 Cleveland Cavaliers shooting guard Dion Waiters dribbles against New York Knicks point guard Pablo Prigioni (9) at Quicken Loans Arena. Cleveland won 109-94. — We’re 26 games in and I’m still not sure what to make of this team. I think the Cavs can be good. I think they can turn a major corner and go on a major winning streak. Or at least a streak of four or five games. Then they go to Chicago and make me stare at the lack of everything and think, "What the?" — The Bulls were vastly undermanned. So was Milwaukee on Friday night. Yet the Cavs got hammered by the Bulls and had to hang on for dear life against the Bucks in overtime — at home. What gives, kids? — People like to blame coach Mike Brown. But the Cavs are having many of the same issues as last season. And Brown wasn’t the coach then. What’s that tell you? Easy answer: It’s a personnel problem. Another answer: Too many of their key players are young and their 7-foot center (Andrew Bynum) can’t really move (yet). — Now, I’m not gonna get all freaked out after one lousy game. (Then again, you could say the win over the Bucks was a lousy game, too — but a win is a win is a win.) But the Cavs are not defending the way Brown wants. I haven’t asked Brown if they’re close, but I don’t need to. They aren’t close. Are they getting better? I don’t know that, either. They gave up 111 to the Bucks the other night. That’s not easy to do. — If you think I’m babbling with no real point, congratulations. You’re correct. Like I said, the Cavs have me feeling confused. An NBA executive (I can’t remember who) told me years ago that a bad loss every 10 games is forgivable. I’d agree with that. The Cavs last two "bad" losses took place at Chicago and at Atlanta. That’s eight games apart. So maybe the Cavs are getting closer to good things. Maybe. — Kyrie Irving can be great in stretches, one of the best point guards in the league. But at the end of last season, I thought he was without question among the top three. Now, I’m not so sure. He looks like he’s regressed a little. I know, I know. He’s had some great nights. His off nights just seem worse. Still, that doesn’t have me panicked. Irving plays a position that typically takes some adjusting under new coach with a new strategy. — So do I have concerns about the Cavs? Let’s just say I’m getting there. They have nine games left before the first West Coast trip of the season (Jan. 10). Among those nine: Philadelphia, Orlando and suddenly wishy-washy Golden State — all at home. They also play Boston on the road in that span. Their trip to the West begins at Utah, followed by a game at Sacramento. Translation: This is a good time to start fixing that win-loss record and climb closer to .500. — Dion Waiters has looked really good lately off the bench, and I want to see more of him. And by "more," I mean I want him on the team — in Cleveland. But somehow, someway, the Cavs need to find another wing player who can hit the perimeter shot and be counted on consistently. Maybe that guy is already on the roster. But to these eyes, it’s a glaring need. I just don’t want the Cavs to trade Waiters to make it happen. — It sounds like the possibility of trading Waiters isn’t even being explored right now. The Cavs averaged more than 110 points a game in a five-game span (leading into Chicago). Waiters was a big reason why. The man can fill it up. I’ve always been in favor of keeping him, but he’s really, really grown on me lately. — Waiters’ right wrist tendonitis doesn’t seem too serious. I did notice him walking around Quicken Loans Arena wearing some sort of contraption on his arm Friday. It’s the same thing Michael Jordan wore on his knees during his (forgettable) Washington Wizards years. It stimulates blood flow or something. — And how’s that for a medical assessment? There’s a reason I write about the NBA. I don’t know if I’m good at this, but I can promise I’m not good at much else. — So what have we learned about the Cavs here? Nada. All I know is they’re 10-16 and the Pistons are in town. Every game is important when you’re in the Cavs’ current state. The good news is, from what I’ve seen lately, they can win when they buckle down defensively. Sometimes, they look overmatched talent-wise (like against Portland). But the Trail Blazers barely beat them, and that says something — since the Blazers apparently drank some sort of magic elixir that has yet to wear off. — These next nine games are vital. The Cavs also play Indiana twice in that stretch. Something has to break soon. Something that makes the fans, the league and the Cavs themselves stand up and say, "OK, these guys are onto something cool." Otherwise, it may be time to start getting serious about making a deal.